Annuals or short-lived perennials, (7-)12-40(-70) cm; taprooted, caudices simple if perennial. Stems (single or multiple from bases) erect to ascending, densely and evenly puberulous-hirsutulous (hairs spreading to spreading-descending or -ascending, often crinkly, bases not thickened), minutely glandular at least distally, usually throughout. Leaves basal (usually deciduous) and cauline; basal blades obovate-spatulate, 10-70 × 4--14 mm, cauline gradually reduced distally, margins entire or with 2-3 pairs of teeth or lobes, faces hirsute to loosely strigoso-hirsute, sometimes sparsely glandular. Heads (in early season, 1-)5-100+ (buds nodding). Involucres 3-4 × (5-)7-11 mm. Phyllaries in 3-4 series, hirsute, minutely glandular. Ray florets 75-150; corollas white, drying lilac, without abaxial midstripe, (2-)4-9.5 mm, laminae not coiling or reflexing (remaining relatively straight). Disc corollas 1.8-2.3 mm (throats indurate and slightly inflated). Cypselae 0.9-1.2 mm, 2-nerved (nerves whitish), faces sparsely strigose; pappi: outer of setae or scales, inner of 6-9(-12) bristles. 2n = 18, 27, 36. 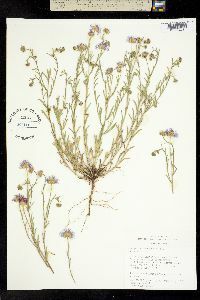 Flowering (Feb-)Apr-Oct. Gravelly or sandy flats, riverbanks, meadows, disturbed sites, desert scrubland to grasslands, saltbush, blackbrush, sagebrush, pinyon-juniper, juniper-oak, oak, and ponderosa pine woodlands; 60-2000(-2700) m; Alta., B.C. ; Ariz., Calif., Colo., Idaho, Mont., Nebr., Nev., N.Mex., N.Dak., Okla., Oreg., S.Dak., Tex., Utah, Wash., Wyo. 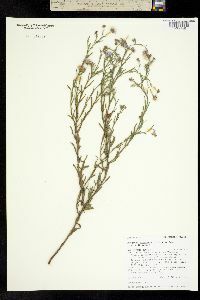 ; Mexico (Baja California, Chihuahua, Coahuila, Durango, Sonora, and southward). 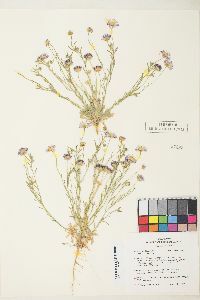 Polyploidy and agamospermy apparently are common in Erigeron divergens and contribute to the variability and, probably to some extent, the polymorphism characteristic of this species. Diploids appear to be scattered through the range of the species, at least in its southern part. 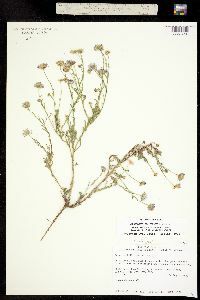 The form of Erigeron divergens with persistent, deeply pinnatifid basal leaves with relatively long petioles and tendency toward perenniality (woody taproots) has been named E. accedens [occurs at 200-1000(-1200) m and flowers Feb-Apr(-May)]. 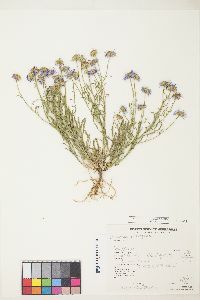 Such plants have sometimes been identified as E. lobatus, and it is possible that they may have originated as hybrids with it; in most ways they are similar to E. divergens and apparently intergrade with it. 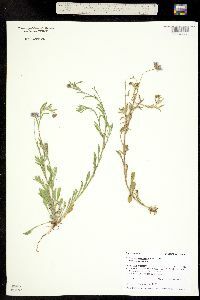 The E. accedens form occurs in California, Arizona, New Mexico, southwest Texas, Baja California, northern Sonora, Durango, and Chihuahua, apparently sympatrically with more typical E. divergens, suggesting that the former is stabilized and self-reproductive (probably agamospermic). Available chromosome counts are triploid. 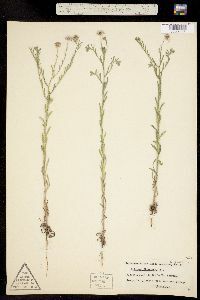 Rare plants (e.g., E. incomptus) may have filiform rays barely extending past the involucre. 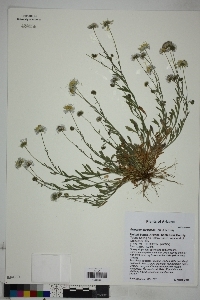 Another common form of Erigeron divergens in the broad sense (mostly in Chihuahua, also southern Texas, New Mexico, and Arizona) has bowl-shaped plants with decumbent stems, a discrete taproot, persistent, lobed basal leaves, and solitary heads topping usually simple stems, and usually is early-season in phenology. 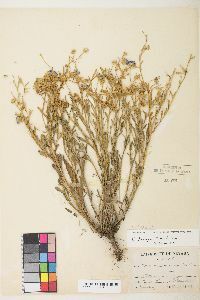 Further comments related to variation in E. divergens are found under 163. 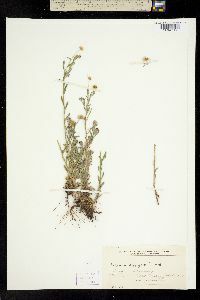 Erigeron multiceps.